DANA POINT — When heading in or out of Dana Point Harbor, boaters often approach groups of stand-up paddleboarders or kayakers and wonder what might come of the situation. Many times, the individuals are novices in the human-powered craft activity and they are often are unaware of boating Rules of the Road and navigation principles, leaving boaters to be on their toes, in case a kayaker or paddleboarder should suddenly turn in front of them. 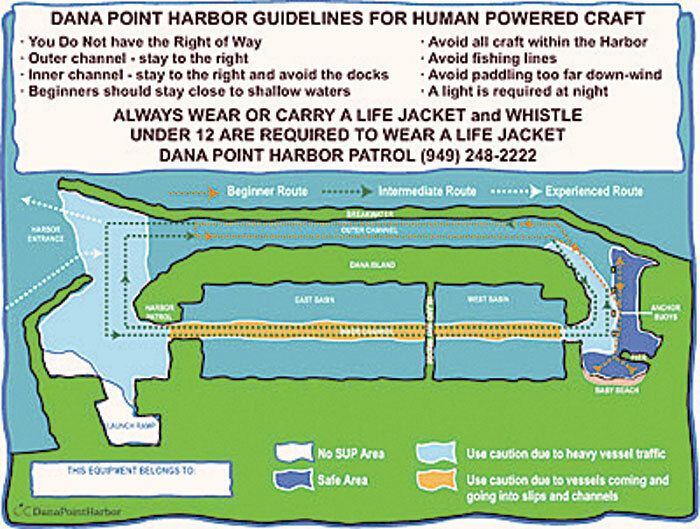 In an effort to inform paddleboard and kayak “newbies,” Dana Point Harbor officials and a group of Dana Point harbor users created the Human Powered Craft Guidelines program. The new program seeks to get rental companies to place a decal on their boards and kayaks, showing a directional map of the harbor along with Rules of the Road. According to OC Dana Point Harbor director Brad Gross, the stickers — along with the large sign posted at Baby Beach, depicting the rules and map — have been a big step in the process of creating a safe harbor. A new program has been developed that should help boaters identify novice paddlers before trouble begins. Both on Memorial Day and Independence Day weekends, a group of volunteer paddleboarders and kayakers acted as “beach ambassadors,” searching out novice human-powered craft riders to educate them on rules of the harbor and give them a lanyard to wear — with a laminated tag that included the safe routes and a list of rules to check. In addition, boaters navigating the harbor channels will be able to identify the tag as well, and can act accordingly, knowing the paddler or kayaker is still learning the ropes.